This post is an epilogue of sorts. The project to process, describe, and make accessible the Meyer Schapiro Collection at Columbia University’s Rare Book & Manuscript Library is now complete. This post is also a prologue. Now that the collection will soon be available to the public, I can only imagine that new scholarly and historical perspectives will emerge relating to Schapiro: his influence, relationships, and contributions to the field of art history. As a historical figure, Schapiro was at the center of many important circles, whether artistic, philosophic, or scholarly and this collection will give the public a new understanding of not only Schapiro but to the historical period of the pre- and post-war years. The collection, with a total of 398 linear feet of material, is a portrait of a man through documents, recordings, and his art works. I’d like to use this final post to give readers a description of the collection and how the records were arranged. Stay tuned for the full finding aid to the collection in the near future. The collection of art historian Meyer Schapiro contains a vast range of material documenting the professor’s personal, professional, and artistic life. The collection encompasses Schapiro’s early academic training to his rise as a prominent theorist and historian of Medieval, Romanesque, Impressionist, and Modern art. His personal life is documented through early school records, course notes from college, typescripts and notes relating to his masters thesis and doctoral dissertation, and photographs and notebooks from his travels abroad between 1927 through 1957. The collection also houses an extensive set of Schapiro’s own art work in various mediums that spans from the early 1920s through the 1980s. Schapiro was at the center of many artistic and political debates from the 1930s through the 1990s and his correspondence in the collection reflects his ongoing support of academics, artists, and philosophers. This includes his efforts to aid German and Jewish refugees of World War II. Schapiro’s professional activities as a professor and lecturer are strongly represented in the collection. Materials include transcripts, outlines, research notes, and audio recordings of his lectures, many of which formed the basis for his written corpus. Also in the collection is Schapiro’s extensive research notes on subject matter relating to art, politics, and sociology that are arranged alphabetically by subject. Included in the collection is a substantial array of Schapiro’s published and unpublished writings, including articles, essays, manuscripts, published works, reviews, translations and poetry. Schapiro’s intellectual curiosity necessitated his own constant reappraisal of his professional written work. This includes editing, clarifying, and expanding upon typescripts, outlines, and notes relating to lectures that he foresaw as being published. A constant source of support for Schapiro’s professional and artistic output was his wife, Lillian Milgram Schapiro. After Schapiro’s death, she would work to complete projects that Schapiro began and oversaw the management of his legacy. As a result, material in the collection that post-dates Schapiro’s death in 1996 was generated by Lillian Milgram Schapiro and is noted throughout the finding aid. This collection is arranged in VIII series. I’d like to thank the following interns for their excellent work in making this project a success. Bronwen Bittetti rolled her sleeves up to work on Series VIII: Works of art, 1920s-1980s; Tamara Kemp organized Series VI: Exhibition announcements, invitations, and press releases, 1920-2001 brilliantly; and Megan S. Rulli jumped right in to sort out Series V: Research files, Subseries: V.2: Articles and clippings. Additional collection management support was provided by Columbia University work-study student Haruna Otsuka. "The function of art history is to determine why individual artifacts took the form they did. This task involves a mastery of widely divergent areas of knowledge, which extend from simple history (if any history is simple) to semiotics and psychology. In relation to the ideal requirements of the subject the equipment of most art historians (myself included) is sadly inadequate. They operate in the conventional, clumsy way in which dentists used to drill teeth half a century ago. But with Schapiro one is constantly astonished by the variety of angles from which problems are attacked, and by the lucidity with which his concepts are expressed. His work is at root visual." Thank you all for following this blog! This entry was posted in archival collections, Archival description, archival processing, art history, Columbia University, Describing Archives: A Content Standard, EAD, Encoded Archival Description, Meyer Schapiro, Primary sources on May 26, 2010 by Administrator. As the project for processing and describing the Meyer Schapiro Collection comes to a close, I’ve come to realize how, like an archeological dig, I sifted through strata of documents, papers, images, photographs, and countless other mediums, to make an intellectual framework for Schapiro’s records. 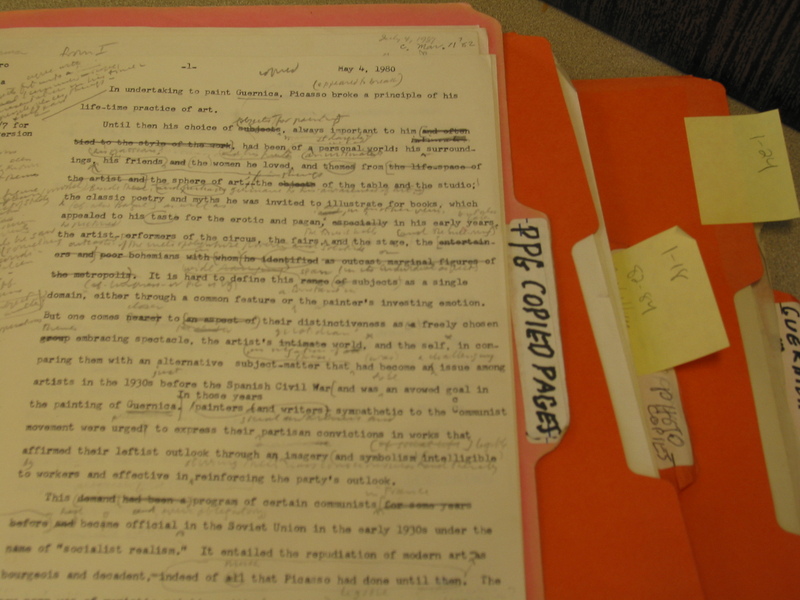 I first came across the linking of the term "archeology" with "archives" in the paper "A Transition of Bits: A Case Study in Preserving the Michael Joyce Digital Papers at the Harry Ransom Center." The authors, discussing the processing of electronic files by hypertext author Michael Joyce, discuss the data recovery and preparation of these files stored on floppy discs from the 1980s as "digital archeology." As they write, "many of the procedures that were used to extract and identify the electronic records were dictated by the characteristics of the storage media. " Because born digital records are easy to create, and countless iterations of a single document can count as potential "records" in and of themselves, the process of understanding where, when, and by whom records are created require a form of authentication. As the authors of the paper suggest, in regards to irregular or incorrect data in countless digital records, there is a "fundamental assumption in digital archeology: we assume that the date provided by the original user is correct. This is really no different than the analogous case in physical archives, where dates are written on paper as best the creator can recall and are subject to error. The lesson learned here is that although digitally assigned dates may be reliable in most cases, they are not immune to error and must be taken as a best estimate rather than indisputable fact." A case in point that is quite important to remember. As archivists and collection managers, we deal with records that, at times, are difficult to ascertain their veracity. 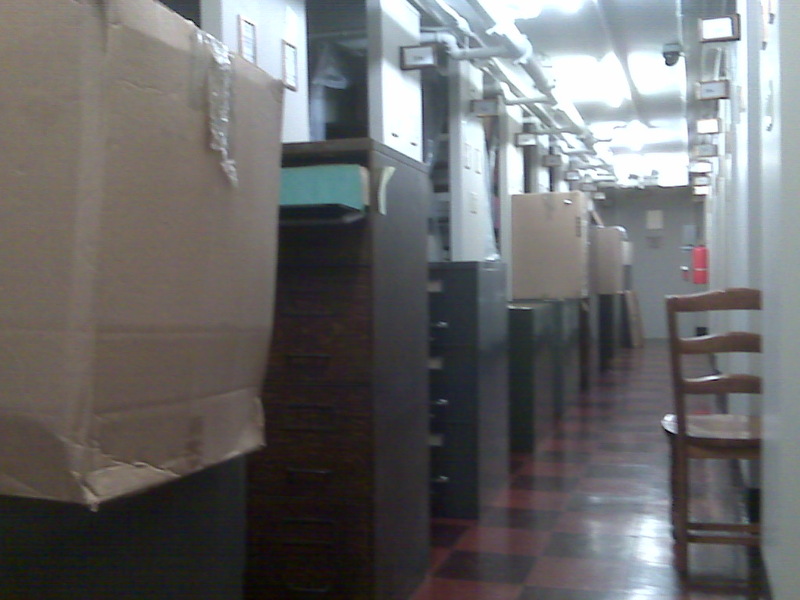 With large physical collections, records are dispersed across cabinets, boxes, and files. With digital collections, files and documents can be of the same content, but with various different file names and located in a variety of folders. Making a cohesive arrangement and description of records requires that you utilize the records as sources of evidence and that, in the end, those evidential exhibits form a larger whole to the records motive. In this sense, extending "digital archeology" to a broader term "archival archeology" suits both practices of analog and digital archival material, but links them in a process that is principal to archival practice: the importance of provenance and the authenticity of records. In the article "Making the Leap from Parts to Whole: Evidence and Inference in Archival Arrangement and Description," Jennifer Meehan gives a stunning overview on how evidence gathered from the archival collection itself can be used to infer why those records were created, by whom, and for what purposes. As Meehan articulates, "As archivists we must reason about the records in this way not only because we are removed from past events by both space and time, but because the information about these events obtained from existing sources is always only partial, and therefore incomplete. Gathering contextual information is not sufficient to understand the various contexts of any given collection. To arrive at such an understanding requires the archivist to make a leap of sorts, an inferential leap from what is available in the present texts (the contextual information) to some past event (the specific activity that gave rise to and/or subsequently shaped the records)." As Meehan suggests of making inferential leaps,"the archivist in effect creates the external and internal relationships of a body of records. Rather than merely identifying these relationships on the basis of gathered information, the archivist for all intents and purposes constructs these relationships on the basis of the inferences drawn from the gathered information." As a case in point, I’d like to give a quick gloss into how archival archeology plays a part in inferring the "parts to whole" relationship of archival records. Meyer Schapiro wrote extensively throughout his whole life. He constantly had in mind various projects that could be potential books, but, for one reason or another, never manifested as books. These files were essentially compiled papers, outlines, and research notes that were assembled and often times paginated to reflect a cohesive manuscript. Schapiro was notorious for revisiting his writings later in his life, reworking, editing, and expanding upon writings from the 1930s to the 1960s. 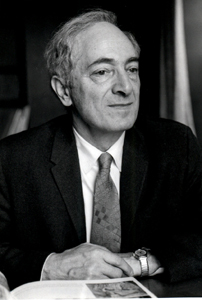 His wife, Lillian Milgram Schapiro, would also aid him in those efforts, and by the 1990s, after he had passed away, she would continue to edit those records (and, to add to the volume of material, she would copy everything in triplicate!). Indeed, it was quite a challenge, when as an archivist, you would see files such as the images illustrated in this post. But it was through archival archeology, and the process of inference, that I came to understand the meaning of these records and what their motives were. For instance, I utilized correspondence and editorial notes to understand the context of these records. I also drew on other record types such as reproductions, editorial notes, and other materials found across the entire collection to synthesize what these records actually meant. 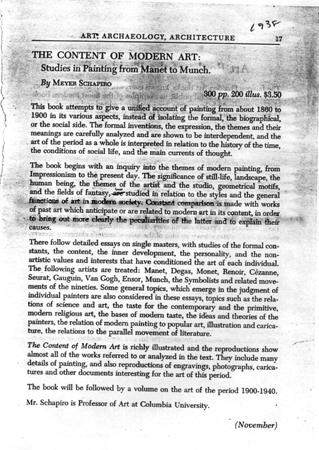 The following is an arrangement note for the manuscript Schapiro wanted to publish titled " The content of modern art: studies in the painting of the end of the nineteenth century from Manet to Munch" and it gives a sense of how complex archival processing really is, and how archival archeology and inference play a part in contextualing records. Providing the researcher a note on how the archival material was arranged, and the process by which inference and archival archeology played a part in contextualing those records, gives the records a sharper focus and plays a part in authenticating their context. As Meehan rightly suggests, one should provide information about "the analytical work done during processing, including the rationale for a particular arrangement, the reasoning behind decisions, and the sources of information used in reaching a particular decision. This sort of information would go a long way toward documenting the archival context of the records. And, if made available to the public, this information would enable users to make their own decisions about the possible meaning order(s) of a particular collection." Describing processes that go into contextualing records can be recorded in order to authenticate records. Following the parameters set out by the InterPARES 1 project "Authenticity Task Force ‘Requirements for Assessing and Maintaining the Authenticity of Electronic Records,’"Michael Forstrom elaborates on this discussion in the article "Managing Electronic Records in Manuscript Collections: A Case Study from the Beinecke Rare Book and Manuscript Library" in the journal American Archivist. The author provides recommendations on how archival archeology, inference, and description can work in tendem “to guarantee the records’ identity and integrity.” These steps include utilizing elements of Describing Archives: a Content Standards (DACS) and explicating on the whole process of preserving and contextualizing the records. In the end, the work of documenting and explaining how a set of records came to be arranged, described, and processed is part of a larger whole: one that balances the use of evidence gleaned from archival archeology with an archivist’s inference into their relationship with the creator of records. This can at times be a journey for the archivist and one which opens the work of archival processing into the sphere of archival documentation: an important reminder on how archival archeology should be utilized as evidence in the process of describing archival material. This entry was posted in Archival Archeology, archival collections, Archival description, archival processing, DACS, Describing Archives: A Content Standard, EAD, Meyer Schapiro, Primary sources on May 11, 2010 by Administrator. Working on an archival project such as the Meyer Schapiro Papers definitely yields fascinating finds. 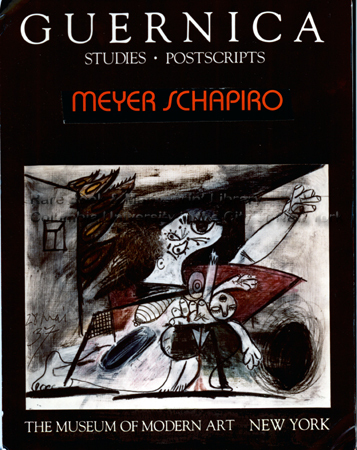 The published writings of Meyer Schapiro, as a contribution to the history of art and human cultural endeavor, would suffice for far more than one distinguished career. But those readers who have found profound inspiration in his texts have invariably been left wishing that he had written at even greater length. What processing the archive thus far has shown is that Schapiro was in fact a prolific writer, and one with an astounding range of interests in art historical periods, theories, and artists. 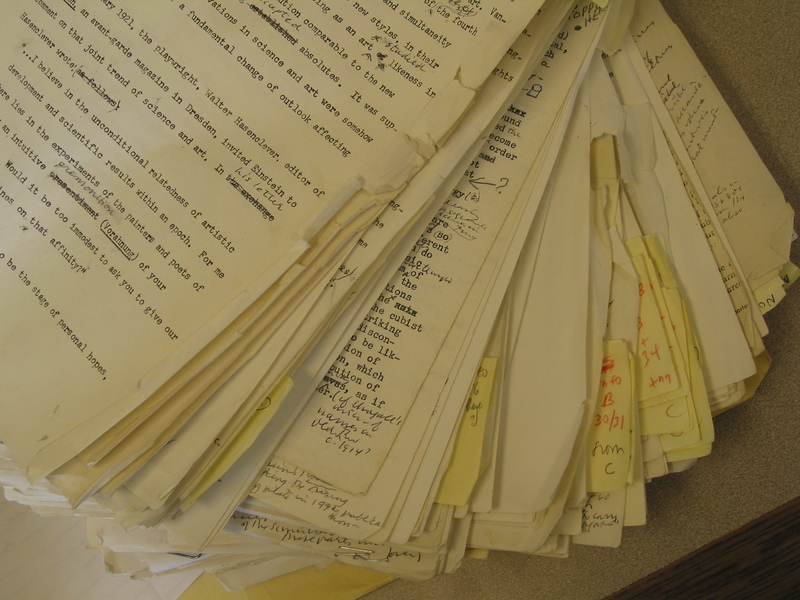 Many works in the archive feature unpublished essays (or sometimes they are extended research notes that can serve as veritable manuscripts for publication). Schapiro wrote about naïve art, modern architecture, the Eiffel Tower, geometrical design, man and machine, and countless artists that span from primitive, anonymous artists to the then current abstract expressionists. In all, Schapiro took painstaking notes, wrote extensively, and retained correspondence with famous artists and philosophers that, if not for almost-item level processing, would not have been highlighted and made visible. This leads me to question several assertions made about the archival method known as More Product, Less Process. Within the archival community, the methodology known as More Product, Less Process (MPLP) has emerged as a sine qua non to answering the perplexing challenge of making archival collections available for research, study, and dissemination. Indeed, MPLP is now working its way across the archival field, allowing archival managers and processing archivists the professional green light to rethink how archive collections are represented to the public and how that very public interfaces with the archival collections themselves. While this methodology has certainly gained traction as a viable means to grapple with the amount of backlogged collections that need attention, the methodology nonetheless has, as I suggest, eclipsed the symbolic resonance of collections. What I specifically refer to as the symbolic resonance of archival collections is their unique character as particular collections that form part of a larger institutional or organizational whole. As plotted out in the 2005 article "More Product, Less Process: Revamping Traditional Archival Processing" by Mark A. Greene and Dennis Meissner in the journal American Archivist, the authors employed a detailed research study to determine how archivists process their collections. They did so in order to determine which actions are slowing down the archival enterprise that shows the public face of the archival profession: namely, accessibility by users to both physical and intellectual components that form an archival collection. The MPLP approach (occasionally referred to as the Greene-Meissner approach) rethinks, or "revamps" as the authors suggest, traditional methods of archival processing. Before the article was published, traditional convention had it that an archival collection was once made public after a finding aid or collections guide was drafted, physical contents of the archive were arranged to mirror that very description, and that the condition of all materials housed in that particular collection were sound both in terms of their conservation and preservation needs. This archival convention is the lure of the archive: that each individual item carries with it direct historical, cultural, or evidential significance. As Greene and Meissner succinctly point out, item level processing has undoubtedly caused a major back log at institutions that hold archival collections. The existing archival culture seems deeply rooted in an implicit belief that every item in twentieth-century collections is so precious that each must be scrutinized for paper clips that might damage a word. Similarly, the culture seems to guard against appraisal decisions that might cast out one interesting document in a twenty-box series of junk. Through their research study, Greene and Meissner focused on the following five areas: Arrangement, Description, Preservation, Policies and Metrics. A year after the article was published, two case studies from the University of Montana and Yale University featured in the American Archivist provided a hands-on view of how MPLP can be utilized in archival settings to maximize archival collections that have collected dust over the past years. Indeed, Greene and Meissner provide working archivists with measured, proficient, and efficient methods by which to control the volume of collections that need to be given due access by potential researchers. But there are several key assumptions that the authors make that should also be given due consideration and be challenged. The conundrum in the authors’ argument is well reflected in the above sentence and one which should be questioned: if MPLP is a methodology used for alleviating backlogged collections, how can the method itself be used across collections within a given institution and when does this vector of using MPLP begin or end? If the heart of an archival institution is their collections, how can a blanket assertion that using only one type of methodology be plausible, given that collections can be used to leverage support from the community, stakeholders, and funding agencies? Indeed, given our economic times, promoting the use of archival collections is as important as highlighting the individual treasures that they also house. Rather than diving directly into using MPLP as the only approach to managing archival collections, archivists should be stepping back and strategically scrutinizing all collections and identifying which ones can yield public attention and funding. This is the case with the Schapiro project, a collection that has already elicited interest by researchers and scholars for shedding light on Schapiro’s role in defining a particular type of art historical scholarship. 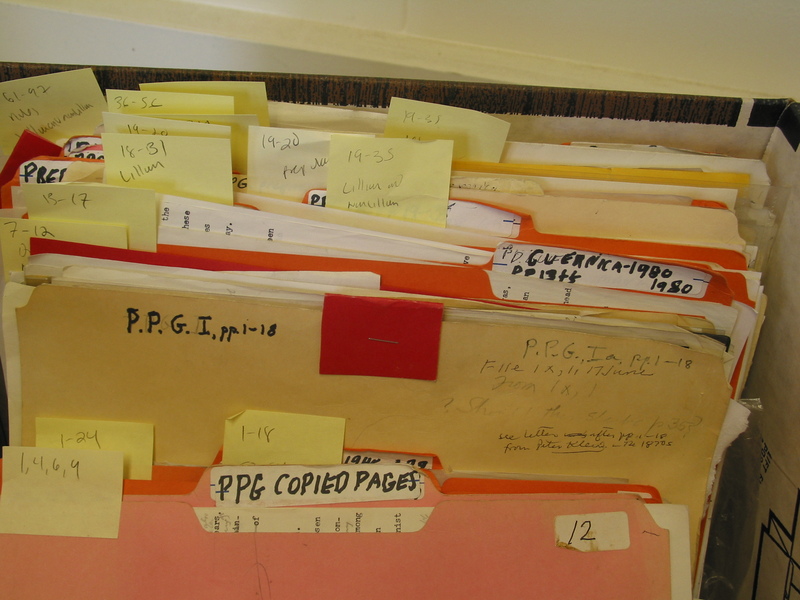 Backlog is an epidemic in many archival institutions, but MPLP as a methodology should be one tool in an archivist’s larger toolkit. Processing should follow a tiered approach that confronts backlog with a much more nuanced look into which collections can resonate and promote scholarship. Collection surveys to clarify, define, and enumerate on the strengths of archival repository holdings should be initiated prior to adopting MPLP across all collections. The authors’ argument that item level processing and description is a fossil of an archival past is complicated by their own admonition of the failure in forgetting about item level processing and description. The MPLP approach can become an acute problem for those dealing with digital files that are by their nature individual files themselves. 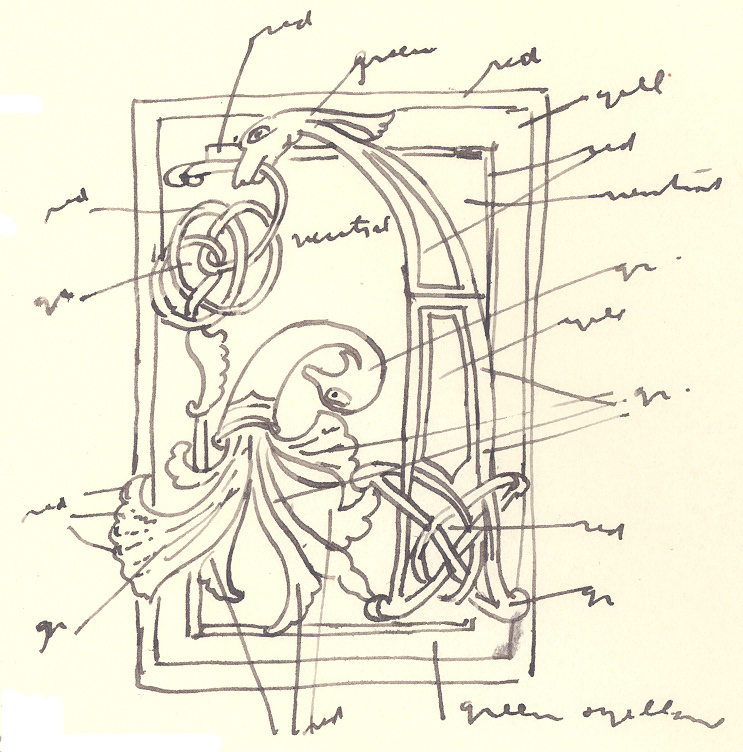 If arrangement and description of the analog material depend on an initial assessment of the value (or intellectual quality) of the collection in the first place, then finely processed collections will by definition be good candidates for digitization and require less additional descriptive work. A few sentences later, they also posit: "Retrospectively, the decision to digitize all or part of a collection by definition makes the collection a candidate for improved analog processing." Throughout the article, the authors are quick to claim that MPLP is the methodology by which to measure how collections should be processed, granting only limited reflection on the cases of those collections that need special care. We are not arguing that some exceptional collections do not deserve more meticulous—even item-level—processing. Nor are we suggesting that it is inappropriate for external granting agencies to fund such intensive and costly work. But we do expect that any project that seeks funding for that sort of work must justify that need against the recommendations made in this study and, perhaps more importantly, that the grantor and the applicant must have a basis on which to calculate the real cost differentials imposed by that more intensive level of work. But if MPLP should be the bar none of archival processing methodology by which all processing should be justified against, how are collections going to be understood as a whole for a particular institution and what are the conditions under which they will be used to attract the public? While it can be argued that using MPLP will provide data to further identify which collections to finely process, we should question what all that data will yield if the archival compass points to MPLP as the ultimate destination: in terms of physical as well as intellectual output. If the representation of archival collections is guided through MPLP, the next step would naturally lead to the question of what is next. And, indeed, continued work on MPLP without reflection on cultivating other collections at finer level leads to an interesting question of why MPLP and finer processing can’t work in tandem. When the authors assert that “good processing is done with a shovel, not with tweezers,” one should ask: why not at the same time? The cultural resonance of archival holdings is their diverse texture in underlining the importance of primary source material that an institution holds. We can’t snub content for the sake of metrics. Proper planning by conducting collections surveys, assessing institutional missions, and understanding user expectations can lead to leveraging collections to their fullest in order to promote an archival repository. These actions celebrate content as much as metrics, a distinction we archivists should remember. This entry was posted in Archival description, archival processing, Less Process (MPLP), More Product on March 9, 2009 by Administrator.